There have been some really exciting developments in the World Hearing Voices Movement over the last year. New groups and initiatives have been launched, established ones have gone from strength to strength and, thanks to people speaking out about their experiences, our approach to hearing voices has had more media attention than ever. For example, Eleanor Longden‘s inspiration talk at TED has been viewed by well over 700,000 people! As an organisation, we have also launched the ‘One of a Million‘ campaign (seeking 1,000,000 pledges of support for our values) and a formal membership scheme. The upcoming World Hearing Voices Congress in Melbourne, Australia, is also set to be a truly exciting and inspiring event. This year, we’re hoping to hear from people, groups and networks who are doing something to get people thinking about, or talking about, the experience of hearing voices or seeing visions. If more than 280 million people around the world hear voices, it seems strange that it’s an experience that – in the many parts of the world – we simply don’t talk about. Come along and join us for the afternoon. All welcome. Bookings: Adrienne at 0272650266 or email: [email protected] with your name and contact details. Please note spaces are limited. You will need to book. We will have a viewing of the excellent Documentary “OPEN DIALOGUE” by Daniel Mackler. In the Far North of Finland, a stones throw from the Arctic Circle, a group of innovative family therapists converted the area’s traditional mental health system, which once boasted poor outcomes for schizophrenia, into one that now gets the best statistical results in the world for first break psychosis. They call their approach Open Dialogue. Their principles, though radical in this day and age of multi-drug cocktails and involuntary hospitilization, are surprisingly simple. Daniel Mackler travels to Finland to see for himself and interviews the therapists involved. Please bring a plate along, for a shared afternoon tea and wonderful discussion afterwards. 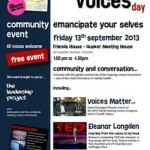 Hearing Voices Network Aotearoa NZ, will host their Annual General Meeting. All are welcome to stay. We rely on the help of volunteers to continue our work and are always looking for people willing to help. Hearing Voices Network Aotearoa NZ are a registered charity independent society. Commited to providing research and support for voices and visions in NZ. 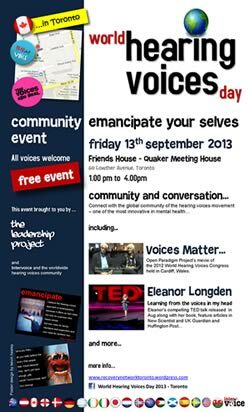 World Hearing Voices Day falls on Sat Sep 14th 2013. There’s lots to celebrate, come join us in Toronto on Friday 13th from 1pm to 4pm. This is a free community event brought to you by The Leadership Project. Your opportunity to connect locally with the world’s most innovative community in mental health.